As some of you already know the death knell has been rung & on Monday 16th July we will be leaving the space that was Ground Floor Left once & for all. 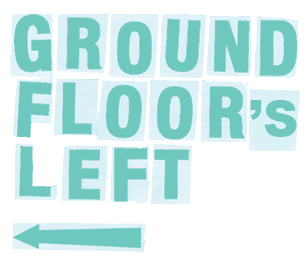 Ground Floor Left has been our life for the best part of three years. Initially a collective project to take over & convert an old textiles factory into a home/studio, GFL quickly became a multi purpose living, exhibiting & project space. We lived without hot water for over a year & went from being unable to hang a shelf to DIY cowboy extraordinaire’s. Three years on & we have hosted too many wonderful events & exhibitions to mention. Although GFL was never a money making venture, its aim was to be self sustainable, whilst offering an affordable platform for emerging artists to showcase their work. It has been a journey & rarely dull but as we speak, due to the insatiable greed of our landlord we are being edged along the proverbial plank into the shiny new olympic pool of creative corpses. The proposed rent increase is so colossal, we are forced to pack up shop & close our doors with immediate effect. Rather than seeing it as the end, we are trying to see it as an opportunity for expansion & growth. With this in mind we’re currently considering our options and will hopefully do something in one form or another in the not too distant future. We will keep you all updated. This process has made us realise more than ever that GFL is more than the crumbling concrete that encases it, it’s our ethos that is at it’s heart. Giving emerging artists & creative’s of all fields somewhere to meet & showcase their work outside of the stuffy commercial gallery setting. Finally an overwhelming thank you to everyone who has supported us in any way over the years. If we said our thanks forever, it would not be long enough. We are anchored, delighted & pale with gratitude. Contact details will remain the same so please stay in touch & don’t hesitate to get in contact about future projects/collaborations etc. We’ll also keep the facebook page open as a document of the space so if anyone has any photos or anything else to send us please post it here.